Want to be notified of new releases in OVlasiuk/dotfiles? This repository is intended for scripts in Python, Bash, and Vimscript, used as hacks and tweaks in my current Linux install. 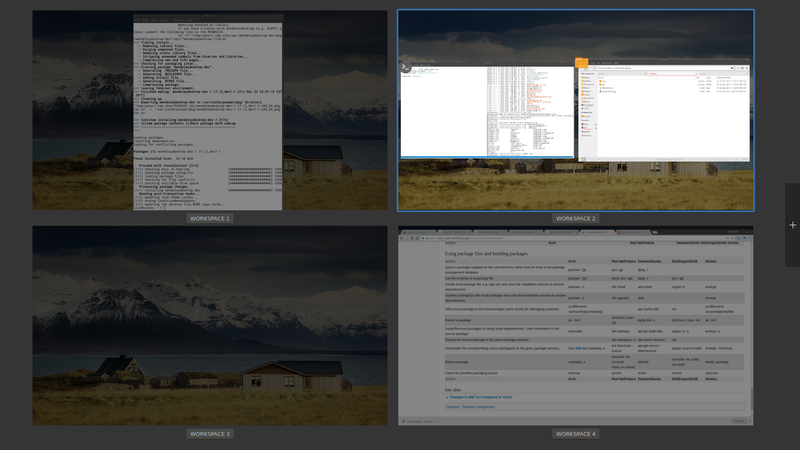 A script that treats the workspaces of the window manager as a 2-dimensional grid. Makes it a little easier to move windows between workspaces. Cinnamon allows direct navigation between the workspaces, but I find it a little nicer to think of the workspaces in terms of a grid. The pictured configuration is the default. The grid size can be modified by passing the appropriate parameter values; see the built-in help for details. to move the current window to the workspace to the left; the directions are determined as in the picture above and periodized, so for example moving left in workspace 1 puts you in workspace 2. There is a Cinnamon applet that is supposed to achieve the same goal, but it conflicts with the Expo, and is quite buggy. A sample startup script for (Neo)vim. I am using it with a Neovim on Arch (Manjaro), and before that on Mint. Essentially everything not related to Youcompleteme, Pymode, and such should be portable. Some autocommands towards the end, especially those involving window motions are quite useful. The dual keyboard layout with set keymap=ukrainian-jcuken is apparently somewhat uncommon, and not very practical; manually remapping the symbols in nmap seems a better option. conque_gdb, conque_term, calendar, delimitMate, diffchar, gundo, NERD_commenter, NERDTree, pymode, tagbar, UltiSnips, airline, airline,-themes, bufferline, solarized, cursorword, fugitive, misc, session, speeddating, surround, tmux-navigator, vimtex, vimwiki, vissort, youcompleteme. They all can be found through the vimawesome.com website, for example.